Another Thursday, Another Market Day. We used to measure our weeks by the weekends, now it is Jeudi, Market Day. The market in France is an institution, it is far more popular than in England. There is a market every day of the week in one of the surrounding towns – but Thursday is market day in Eymet. And almost everyone comes into town for the market. It is not only a place to shop, but a meeting place. 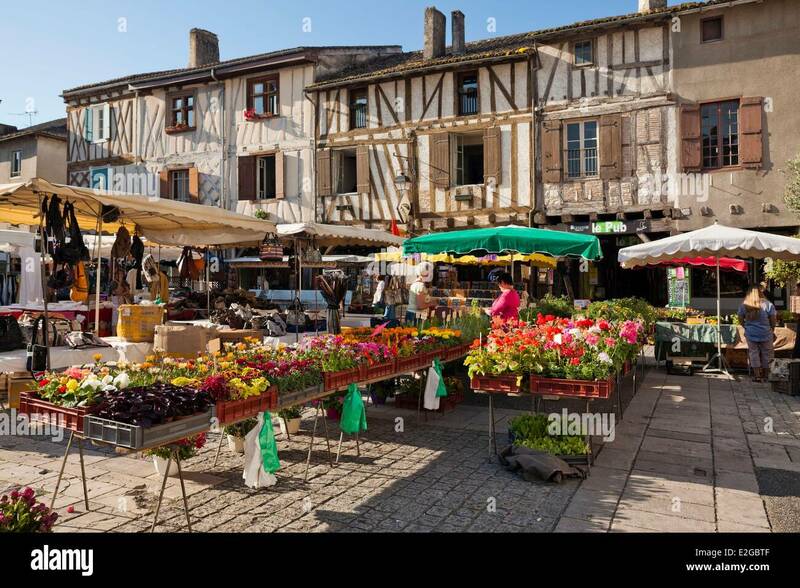 The town is transformed, the normally (in Winter) deserted square if full of stalls; a real butchers, two fresh fish stalls selling every variety you could ever want, cheeses from all over France, fantastic vegetables, many of them local and ‘bio’. There is a man selling hats of every shape and size, a few clothes stalls as well as others selling jewelry or children’s toys. And then there are the hot food stalls; rotisserie chicken, paella, a Chinese van selling nems. The market sets up around seven – and I am there to serve them coffee. And by 1 it is all over, the stalls are all packed away into vans and driven off, the square is clean, every scrap of paper and litter is taken away. By 2 you would never know there had even been a market at all. It is quiet again. Until next Thursday when the transformation takes place again.